Brand New Listing on sought after Long Pond! 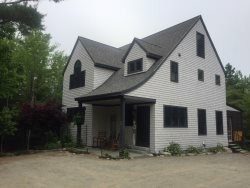 Pinon Cottage is nestled in a private wooded setting on Long Pond, a favorite pond on Mount Desert Island for canoeing, kayaking, swimming, fishing and listening to the resident loons. Complete with its own dock on the pond, large deck with comfortable seating, hot tub, and screened in porch, this cottage is the perfect retreat for getting away from it all. Inside you will find quality furnishings and linens. With its central island location, you're never too far from any of the Island's villages, Acadia National Park, hiking on Beech Mountain, or picking up fresh produce at Beech Hill Farm. Main Level: A walkway from the driveway leads you to a large screened in porch with ping pong table. From there, enter the house into a great room with a wall of windows and doors facing the lake. Coupled with the warm wood on the floors and ceiling, this creates a very bright and inviting space. The living room with comfortable seating and a large wall-mounted television is open to a dining area with a table that accommodates eight, and a kitchen with an island that has two stools. Beyond the kitchen is a full bathroom with shower and a stacking washer/dryer. Next you will find a bedroom with two sets of bunk beds (1 with a trundle). Upper Level: Stairs at the front entry lead to a bedroom with queen bed and a ½ bath. The bedroom has a window overlooking the Living Room, which has a shade for privacy. A large window and skylight provide plenty of light. Should you need it, there is an AC unit in this room. Outside: Doors between the living area and dining area lead to a large deck with comfortable furniture and a hot tub. At the base of the deck is a foot wash and you will find an outdoor shower on the side of the house. Take the short path down to the dock and enjoy the water! Included in your quote is the rental rate, the state lodging tax and our processing fee, A Refundable $500 Security Deposit is also added to your lease.